Clothes make the (wo)man - We make the Clothes. Dress was and still is an external sign for class and gender, age and marital status of the wearer. Even at the first glance it discloses an enormous amount of information to the beholder. By carefully selecting our clothes we can choose ourselves what this information is going to be, and, knowingly or unknowingly, do it every time we get dressed. To make a real or fictional historic person tangible, all the different parts of the outfit have to be carefully selected to match the impersonated character and the equipment as a whole. It takes great familiarity with historical sources such as original textiles, contemporary portraits and fashion plates, tailoring instructions and other written sources to ensure that cut, material and making be as consistent as possible with class and age of the person. I will be happy to accompany you on your way from the concept of a character to the completed logical and historically accurate outfit, I do enjoy your ideas and creativity, and will do the research to find hisorically documented solutions for even the most extravagant or specific wishes. 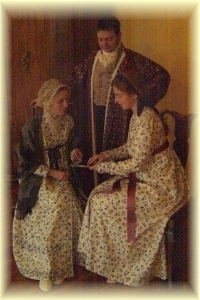 To ensure that the re-created historical garments are not only historically correct for time and place and occasion, but also help to express the individual personality of their wearer, intensive communication especially during the planning stage is required. To begin with we will jointly develop a first draft, and select cut and colour. The most pleasant way to do this is to peruse the sources with a nice cup of tea at hand. The next step is to create a toile based on your measures, and to help you choose your fabrics. Many of the materials will be ordered abroad or in small weaving mills, or hand-printed for you in traditional workshops. If the toile fits and the materials have arrived, work on the actual garment commences. For all but the simplest garments a second fitting will be arranged, when last adjustments to ensure perfect fit can be made. e-mail or fax, but also the telephone and good, old-fashioned letters.